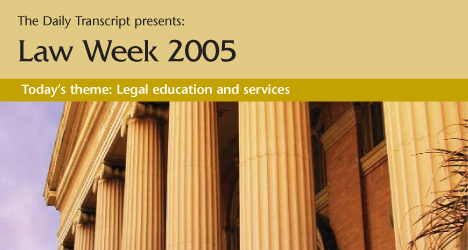 The Daily Transcript celebrates Law Week with our annual week-long series honoring the business and system of law locally, nationally and throughout the world. Today's theme is legal education and services. There are some things the Federal Bureau of Investigation won't tell you, of course. The surprising thing is what some of those things are. Ask Brenda Peterson to tell you how she's built her business into one of the largest independently owned court reporting and video services in Southern California, and you won't hear her recite the typical roster of impressive law firms. A little-understood provision in the standard form used in San Diego for residential real estate purchases is the mediation clause. In it, the buyer and seller agree to mediate any dispute they have. If a party refuses to mediate, the party is denied attorneys fees that he or she might otherwise be entitled to in subsequent litigation or arbitration. Rich Sparber, chairman of the Business and Real Estate Practice Group, established the San Diego firm of Sparber Rudolph Annen in 1974. As a major Pacific Rim gateway to Latin America, the Far East and Southeast Asia, San Diego is an exceptional location for the study and practice of international law. San Diego's border with Mexico, for example, generates innumerable legal issues involving immigration, investment, trade, labor and the environment, which reflect similar challenges throughout the world. Interest in law is at an all-time high. It has become America's latest spectator sport. This interest seems to focus on the most dramatic and bizarre aspects of the legal system: the OJ Simpson and Michael Jackson trials, the Rambo Litigator, the know-it-all legal commentator, the screaming lawyers panel. As chair of a large law firm's Pro Bono Committee for a number of years, I have had the chance to interact with hundreds of attorneys inside and outside our firm on the issue of pro bono legal services. Some lawyers donate time on a daily basis; some take an occasional case; some do not donate at all. When Elise, 80, was evicted from her granny flat by her landlord after complaining multiple times of the sewage smell leaking through her pipes, she didn't know who to turn to for help. For a second year in a row, the University of San Diego School of Law's tax faculty has been ranked first in the western United States among faculties with graduate tax programs by U.S. News and World Report. All attorneys are comfortable working at their desks, some attorneys are comfortable in court, but very few attorneys are comfortable doing street investigation. And unfortunately, it is often the work that was not done on the street that leads to wrongful convictions, and no amount of desk work or court work can ever fix it. Trial lawyers have enough challenges preparing for trial. But when sensational cases are dissected in the media before the trial begins, lawyers are forced to deal with a new concern. Most real-life expert witnesses don't lead lives that are quite as edgy and exciting as their Hollywood counterparts depicted in the TV show "CSI" and its many clones. But they often play a central role in helping both prosecutors and defenders prove their cases. The U.S. Supreme Court Tuesday gave stock investors a stern but necessary warning: don't look to litigation as an easy path to recoup losses. SEATTLE -- Microsoft Corp. (Nasdaq: MSFT) will pay computer maker Gateway Inc. (NYSE: GTW) $150 million over four years to end a long-running legal dispute, and Gateway says it will use the money to market and develop products that run Microsoft software. A group challenging the heritage of some members of the Rincon Band of Mission Indians took its case to the 9th Circuit Court of Appeals this week. SAN FRANCISCO -- California hospitals can no longer recover from insured patients the difference between a hospital's actual costs and what insurance companies pay for medical services, the state Supreme Court ruled. The Daily Transcript wraps up its week-long series celebrating Law Week with a look at solo practitioners and small firms. The Daily Transcript celebrates Law Week with our annual week-long series honoring the business and system of law locally, nationally and throughout the world. Today's theme is national litigation practices, and we'll also take a look at criminal defense and white-collar crimes, class action lawsuits, and more. The Daily Transcript celebrates Law Week with our annual week-long series honoring the business and system of law locally, nationally and throughout the world. Today's theme is intellectual property and other specialty practices. The Daily Transcript celebrates Law Week with our annual week-long series honoring the business and system of law locally, nationally and throughout the world. Today's theme is full-service law firms, and we also take a look at immigration, corporate and international law, among other practices.